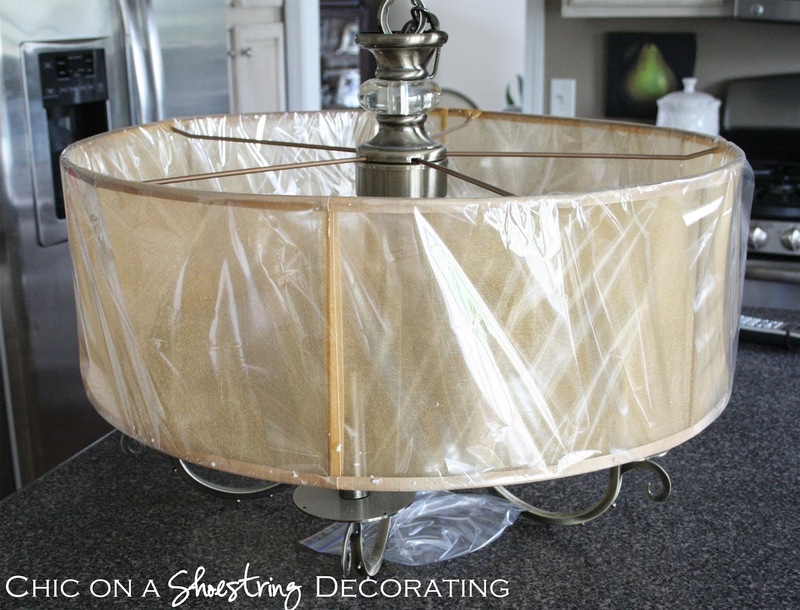 Chic on a Shoestring Decorating: Chandelier help... can I paint this fabric? Chandelier help... can I paint this fabric? I love the style, it has pretty crystals that attach and hang from the chandelier for a little bling-bling. But the color.... umm, it is not so good. Especially that shade, the picture is actually making it look better than it looks in real life. The shade is sort of a shimmery baby poop colored brownish gold. It just ain't workin' for me. I've looked for a replacement shade and can not find one this large, it's about 24" across. Plus, the shade frame is welded to the chandelier and not removable but I can't find one anyway so who cares. I know I can recover the shade with new fabric but since I've never done this before I'm a little worried that it won't turn out well and will look sloppy. Do you guys think I can paint this fabric with fabric paint? It is a see-through, shimmery, satin-type fabric. Do any of you have any experience painting this type of fabric? I'm scared I'm going to ruin the whole thing. Hi Kate, hmm I never painted a shade with fabric paint. I used simple acrylic paint, and it worked well. I would try watering down the paint. I think it would give the fabric a nice softer look. Then you can embellish the shade with gems, diamonds or a nice trim that matches the room...that's what I would do...Millie. I agree with Kelly. If you try her temporary lampshade idea with the fabric you can get a feel for what will look best. Maybe you'll find something to complement the bling-bling! I would love to see what you come up with. I have painted fabric lamp shades with chalk paint and they turned out gorgeous. You would never know I painted them!! It would work lovely in my bedroom! Just saying........... LOL! I have painted several lamp shades...just do a "search" on beckwithstreasures.com. My philosophy...if you don't like it, you can't hurt it by experimenting on it! There are companies that recover lamp shades. I have no idea what they are priced like but most offer a free estimate. Here the link to one I found on the internet, http://www.shades-unltd.com/index.htm. I don't know anything about this company, it is just an example of what is available. Good luck with the project, now you have an alternative if the painting doesn't work out. What a lovely find! I wouldn't even bother trying to paint it, but would recover it with fabric. I agree with those voting for fabric. I think a nice neutral linen would look great. I just bought drumshade ceiling fixtures for my living room and I love them! I would try to rit dye it with a spray bottle http://thecraftiestallie.blogspot.com/2013/05/vintage-chair-made-beautiful-how-to.html. This way it still looks shimmery. It may take a few coats to achieve the color you want though since you can't soak it in dye.